My youngest daughter from the age of two was fascinated by Orca whales. Mesmerized by the lead actor in the “Free Willy” movies, she would also instantly snap out of the deepest slumber when a Marineland commercial was overheard on the television. So unlike some children who are fascinated with puppies, kittens or ponies, my daughter developed and retained a deep love of Orca whales. All parents have an instinctive desire to satiate the desires of their children. For dog lovers, you get them a puppy. For cat lovers, you get them a kitten. For the horse lover, you take them to fairs where they can ride a pony or perhaps take riding lessons. For whale lovers you …. do the best you can. 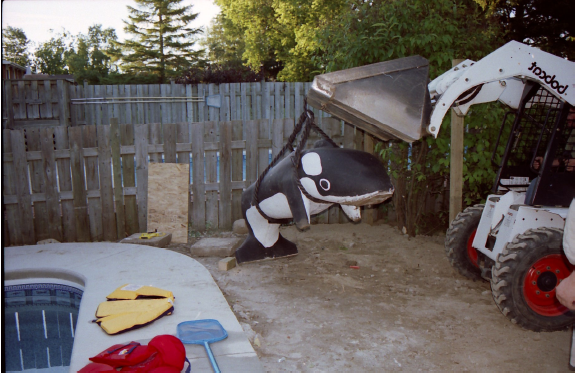 You partake in the occasional trip to Marineland, purchase a healthy stock of “Free Willy” movies and acquire a few hundred stuffed Orca whale toys for the “deep sea” motif bedroom. For a number of years when my children were very young, I had kept one of those $200 Canadian Tire aluminum wrapped algae ponds in the backyard, commonly misrepresented as a “pool”. After a few years of risking my children’s health, I had accumulated the means to put in an in-ground swimming pool. While insufficient in size to contain an Orca whale as a pet, I could indeed acquiesce to an Orca whale themed pool liner and the usual menagerie of whale-shaped floating toys. The summer I was to put the pool in, I was working in Des Moines, Iowa. Des Moines is over 1100 miles from the Atlantic Ocean and 1700 miles from the Pacific Ocean and thus an unlikely place to find an Orca whale. However, I did. She was cute. Currently ensconced in the display area of a concrete lawn ornament manufacturer, she was a 5 foot long Orca shaped bench. Her Orca shape, including dorsal fin and black & white colour would certainly be a thrill to my daughter when the orca was added to my yet-to-be-built pool deck. So I bought her…. in Des Moines and hence Project Orca begins. It was my good fortune to have a close Canadian friend who also worked on the same project as I and he frequently chose to drive back to Ontario instead of fly. He also had a small pick-up truck, so the transport logistics for the new family pet seemed quite easy, when my friend agreed to bring her home for us a distance of over 800 miles. I called the vendor where I had purchased her to let them know that we would be picking her up the following weekend. He then provided the first clue to what would turn out to be a substantial project. “What time will you be arriving? I need to order the crane.”, he asked. “Just a 1480 pound concrete Orca whale”. While my friend was in transit, I had flown home and was preparing to receive my new whale. Pool construction had not yet begun, so I needed a place to store the whale until the pool was completed. Knowing that she was quite rotund, I devised a dolly platform onto which she could be lifted. The ¾” plywood reinforced platform included 8 industrial rolling casters on the bottom, so that she could be easily rolled out of the way of pending construction activities. I then rented a Bobcat skid-steer to lift her from the truck to the dolly on our driveway. The whale arrived and the truck look like it was running with flat tires, weighed down beyond capacity. Some sturdy tow ropes and we lifted her to the waiting dolly. I carefully placed her on the dolly and the dolly prompting sunk to the wood burying the casters into my newly paved asphalt driveway, to remain there as a unique driveway ornament for the neighbours to point at for the next few weeks. Construction on the pool begins and as part the contract I have asked the builder to put the whale (now named Valerie by my daughter) on the pool deck when they are done. He agrees. In the process of digging the hole for the pool, the crew has unearthed 2 massive, multicoloured boulders. My guess is that each boulder would be in excess of 1,000 pounds and I chose to keep them for landscaping instead of having them trucked off with the rest of the earth removed. So after removing them with an excavator the builder left them for me to deal with in the front yard. The pool is built without issue and the last job is just finishing early in the am, pouring the concrete pool deck. The builder comes to me and asks if his crew can move onto the next job, since they are done early. He says that he is sorry he can’t move the whale yet because the concrete is not yet set, but if I don’t mind doing it, he’ll leave me the bobcat skid-steer. Perfect! I love playing with heavy equipment. The next day, it is time for some fun. First, I’ll do the boulders, it’ll give me some practice before moving “Valerie”. It has been decided that the ideal place for the boulders is in the back yard, one on each side of the steps of the newly built wooden patio deck. I climb aboard the Bobcat, pull the metal “amusement park” style safety bar down over my shoulders and chest and start the engine. In a few minutes, I am completely comfortable with the controls and successfully demonstrated that I can tear up a lawn with the skid-steer professionals. So I put the first boulder in the bucket. Well actually … it looks like it would fit in the bucket, but it won’t. So for the next hour, I chase the boulder all over the front yard, trying to flip it onto the bucket but for the most part just pushing it around the yard like some sort of mechanized game of polo. Eventually, I give up and push the boulder into a small hill, get out a hydraulic jack and literally push the boulder into the bucket. I climb back aboard the skid-steer and now lift the boulder and drive slowly to the backyard. I have marked off where I want both boulders put and I line up the first boulder at her mark. Tilting the bucket to slide the boulder off, it does indeed. While I was pretty good at high school physics, I seem to have forgotten the basics any more. A 1,000 pound boulder when lifted high into the air and then tilted out of a bucket (ramp) will respond to the force of gravity, rapidly accelerate down that ramp and will not in fact drop straight down but will crash into your new wood deck rendering the deck useful for kindling or toothpicks. So with this demonstration of skill and competence under my belt, I go to get something much bigger, much heavier to move, “Valerie”. I have now wrapped “Valerie” in nylon tow ropes and attached the rope securely to the bucket of the Bobcat. I climb in, set the safety bar, start and lift. With the bucket 4 feet off the ground Valerie lifts a few inches off the dolly for the first time. Ever so slowly I move her towards the side of the house for her journey to the pool deck. Between the house and my newly installed fence is probably a distance of 8 feet or so, my lawn slopes up gradually from the front to the back yard and slopes away from the house. This means that it is both a reasonably tight fit and the slope makes it necessary to lift the height of the bucket as you approach the back yard. I am being very careful and moving slowly. As the ground rises in front of me, I lift “Valerie” an inch or two and move a few feet further. I keep repeating this process until I am about half-way down the side of the house. I am about to repeat the process again when “Valerie” heads for the fence, pulling the Bobcat over on its two downhill wheels and the two other wheels now up in the air., the entire 8,000 pound machine now precariously positioned now to simply roll-over and roll-over my new fence as well. Physics lesson of the day #2. While I was fixated on ensuring that “Valerie” was just above the ground as I moved forward, I was paying much less attention to the fact that the bucket was now some 7 feet in the air, creating a highly unstable centre of gravity and with no apologies for the laws of physics, simply fell over. Okay what do I do? First, turn off the Bobcat. Yell at the kids to stay away. Time to think.Okay, this will be simple enough, start the Bobcat, lower the bucket, Bobcat will right itself and then put on a much shorter lift rope and start again. An audience of neighbours has now gathered to gawk and offer helpful suggestions. I stick with my plan. Beep, Beep. Indicator light – Not Level – The Bobcat can’t be started on an incline. Okay then I will just have to right the Bobcat manually somehow. I lift the safety bar to exit. It won’t budge. Anytime the bucket is lifted, the safety bar locks down to keep it’s driver inside and safe. So I am now locked into a Bobcat that I can’t start, almost tipped over, with a whale inches from destroying my new fence. What could be worse? The neighbours are killing themselves with laughter and has asked one of their kids to run and get a camera in order to keep this particular moment for posterity. the back yard, where we once again pick her up and finally placed her on the pool deck to remain forever. Someday when I move from this house, Valerie will stay to be adopted by the new family and I will leave them with a copy of this story, so they can explain why they have an Iowan Orca in their backyard.